Well that would have to have been one of weirdest weekends of my life! I helped Babes move all day Saturday, loaded up what he was taking from here and unloaded in the pouring rain carrying furniture up 3 flights of stairs to his apartment. I helped him place furniture, cleaned a few things, unpacked crockery and get this . . . I even helped him build the beds and then make them up! So weird, us standing on each side of his bed smoothing sheets down and fluffing up the duvet!!! A bed that in all likelihood I will never sleep in but the third party will!!! Anyway, I have my reasons for being so obliging! On the outside I was all calm and happy, for the Princess's sake mostly and on the inside I was falling apart. I left the Princess to spend the first night in the apartment with her Daddy and I took off to my brothers home for the night where my lovely sister in law cooked a roast dinner and we sat until 1.30am drinking a lot of wine and talking! She then tucked me in with hot water bottles, cooked poached eggs for breakfast yesterday and I came away feeling like my soul had been soothed somewhat! Today I am going to go shopping for food and give my house a thorough clean and rearrange furniture to fill in the missing gaps! I am going to wipe lemon juice around my door and window frames and flick water through all the rooms to cleanse away negative energies. 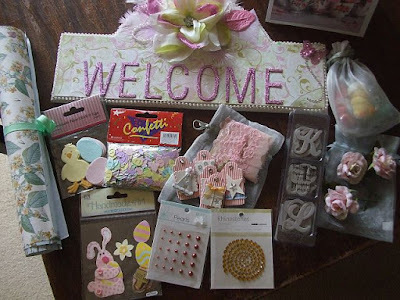 I'll leave you with a photo of a generous supply goodies I won from the lovely Linda of Many Things to Do!